One of our top initiatives at Hartz is to provide effective preventative flea and tick care for your companion animals. These small and silent parasites have canny ways of creeping into your home and onto your pets. And it only takes a few to create a full-scale infestation. Fleas are the culprits of various dermatological and medical conditions that cause discomfort to your furry friend and decreases their quality of life. Flea allergy dermatitis, anemia and tapeworm are among the most common conditions fleas are responsible for. Ticks are another culprit that transmit and cause numerous illnesses. These include: Lyme disease, Rocky Mountain spotted fever, erlichiosis, babesiosis and tick paralysis. A vast majority of flea infestations originate outdoors. The lifecycle begins with adult fleas laying 20-40 eggs per day on their host. The eggs fall off the host into the environment where they hatch into larvae. The larvae feed on organic matter and eventually spin a tiny cocoon and pupate. Once the adult emerges it begins searching for a host. 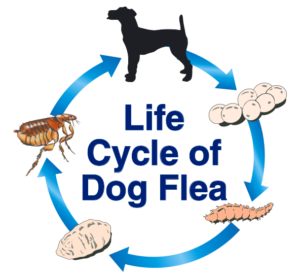 The flea lifecycle can take 3-4 weeks to complete depending on environmental conditions. Cooler temperatures will delay development. Although fleas can jump and crawl short distances, their primary mode of transportation is the movement of wildlife hosts (opossums, raccoons, foxes, coyotes, skunks, feral cats and dogs are prime transferors), which carry them from place to place. As adult fleas feed on their host, they excrete partially digested blood called flea dirt. To the naked eye, flea dirt appears like fine, black specks. Most of this waste falls off the host and becomes essential nutrition for flea larvae. Flea dirt is the best evidence that these little bloodsuckers are taking up residence on your dog or cat. Incessant scratching and biting are also indicative of an infestation, but not always telling, as some pets don’t seem bothered by the bites of these hitchhikers, while others suffer severe allergic reactions. Because developing fleas cannot survive in direct sunlight, larvae thrive in the shade – where cats and dogs frequently rest and/or sleep. Even indoor pets are at risk. Pinpointing the origin of an infestation is very difficult. External sources can be anywhere: parks, kennels, veterinary clinics, other homes, infested pets of friends and family, wildlife intrusion in your attic, basements and crawl spaces. Fleas can also hitchhike on people. Most infestations go unnoticed for 6-8 weeks until the population growth peaks and become apparent. During this period, flea eggs are continuously deposited on the host. Several flea generations are produced while adults are cyclically emerging for 1-3 months – putting your pets at risk for re-infestation both inside and outside your home. Even more concerning, flea cocoons allow adults to enter a quiescent state for up to 6 months, where they will delay emerging until they detect a potential host. Once triggered, they surface quickly and are the start of another infestation. At any time, an infestation can begin again, so it is important to take advantage of scientifically proven products containing insect growth regulators to control these pesky parasites. As soon as tick larvae hatch from their eggs, they search for a host (usually a small animal) for their first blood meal. Ticks search for hosts by questing. They crawl to the top of debris or blades of grass and extend their front legs. When a host walks by they will latch on and find an ideal location for feeding. Once fully engorged, the larvae fall off the host and molt into nymphs. Nymphs then find a suitable host, feed again and drop to the ground to molt into adults. New adults feed and typically mate on a larger animal. Afterwards, the female tick will detach from her host, lay eggs on the ground, and die. Males mate with many females before also dropping off and dying. Outdoor areas with long grasses are a favorite retreat for ticks, though parks and even other pets can introduce a few stowaways to your parasite-free pooch or cat. Ticks burrow their mouths into your pet’s skin, attach and feed off their blood. As they become more engorged, they are more noticeable. Removing ticks requires a delicate touch, as pulling or squeezing too hard could release disease-filled fluids into your pet, or leave the mouth parts stuck in the skin. 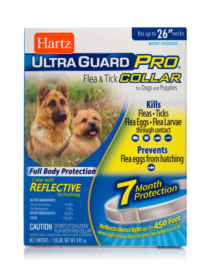 In the 1960’s, Hartz introduced its very first flea and tick collar. Today, our ectoparasite prevention products remain best-sellers. Whether you prefer protection in the form of a collar, drops, shampoos or sprays, Hartz UltraGuard solutions will help you effectively remedy visits from uninvited guests. Our line of flea and tick home products also effectively kill fleas and ticks on rugs, carpets, bedding and furniture. We recommend an integrated and complete approach to pest management; treating the whole problem is the key to a pest-free environment. Maintain your pet’s health with flea and tick control products that are appropriate for their lifestyle, weight and age. Year-round preventative care is recommended. There are many species of ticks that are able to survive well into the fall. Certain regions experience warmer, shorter periods of cold weather. Even during winter, fleas and ticks can lay dormant, waiting to emerge on an unseasonably warm day. During colder months, both types of ectoparasites can sustain themselves if already indoors. 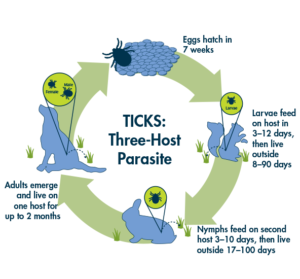 Topical Drops – Protect your cat or dog for up to 30 days with a single application to kill fleas, and ticks, plus prevent re-infestation. Hartz Ultraguard flea and tick drops come in the form of applicator tubes and contain a fast-acting liquid formula that is applied on the pet’s back, directly onto the skin. The compound spreads throughout the sebaceous glands across the skin – thereby providing protection from head to tail. Repeat monthly for uninterrupted defense. Topical Sprays – Get through flea and tick season without an itch! 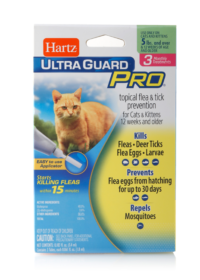 Hartz Ultraguard Plus Flea & Tick Pet Sprays kill pesky fleas and ticks for up to 7 days while preventing re-infestation by stopping flea eggs from hatching for 30 days. The convenient spray bottle disperses a wide, gentle stream of product enriched with calming aloe to help soothe your pet’s flea bitten, delicate skin. Hold bottle upright about 6 inches from pet and spray lightly until the tips of your dog’s fur are moist, taking care to avoid contact with the eyes. Rub spray into your pal’s coat and rub them dry with a towel after 10 minutes. Comb and brush coat. Repeat weekly if necessary. Collars – One of the most popular options, flea and tick collars release active ingredients that kill fleas and ticks. They can be worn in addition to your pet’s regular collar. Hartz fresh scented collars come in various neck sizes to accommodate all breeds of cats and dogs. 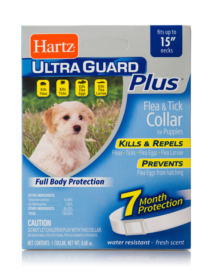 Hartz Ultraguard Plus or Pro collars kill fleas and ticks for an impressive 7 continuous months. The easy-to-use application goes to work on contact. The water resistant design remains effective even after bathing, swimming or playtime in the rain. Some even contain reflective strips for bonus visibility. For nonstop flea and tick protection, replace the collar every 7 months. Powders – The ultimate weapon against fleas, ticks and lice, Hartz Ultraguard powder for cats and dogs eliminates these intruders with a potent ingredient through contact. The water-resistant powder effectively kills fleas, ticks and lice for up to 7 days. Simply dust your entire pet beginning at the head and working back, taking care to treat legs and paws. Massage powder through fur so it makes contact with the skin. Also lightly dust any bedding. Repeat entire process at weekly intervals if necessary. Shampoo – Hartz UltraGuard Flea and Tick Shampoos provides your pet with immediate relief from pesky fleas and ticks. Each cleansing formula is specially designed to kill parasites on contact. To use, wet pet’s coat thoroughly with water and rub shampoo into coat, ensuring not to get suds into the eyes. Massage from head to tail until coat is completely covered with a foamy lather. Let stand or continue to massage for 5 minutes. Rinse and towel dry. Repeat weekly if necessary. The critical second step is treating your home. Unlike ticks that only breed outdoors, fleas can thrive indoors. Female fleas start producing eggs 24 to 48 hours after taking their first blood meal and can lay up to 50 eggs per day. These eggs are laid on your dog and easily fall off onto bedding, carpets, furniture and everything else your dog comes in contact with. Where your dog rests and sleeps becomes a primary habitat for eggs and developing fleas. Hartz® UltraGuard Plus® Carpet Powders target and kill all stages of the flea and tick life cycle. Adult fleas and ticks are wiped out for up to 30 days and eggs and larvae for up to one year. To use, shake the carpet powder lightly onto a 3 foot by 3 foot area. Make sure to cover any dishes or pet bowls and food before application. Let the powder sit for two hours before thoroughly vacuuming the whole room. Only use once a month. Hartz® UltraGuard Plus® Home Sprays contain effective ingredients to rapidly kill fleas, flea eggs, flea larvae and brown dog ticks on contact, plus prevent re-infestation for up to 7 months, so there’s no need to call an exterminator. If you are facing a wide spread infestation, Hartz® UltraGuard Plus® Home Foggers provide the strongest solution, utilizing active ingredients such as Pyrethrins with an insect growth regulator to kill fleas, flea eggs, flea larvae, ticks, bed bugs and mosquitoes. This product also prevents flea re-infestation for up to 7 months. Successful preventative health care has long-term advantages for your pet and your family. Hartz wants to help you take action against unwelcomed parasites. Preventative care is more effective and less expensive than treatment if your pet develops a medical condition that could have been prevented.